Abydos was covered with finely carved murals and hieroglyphs, many of which are in remarkably good repair, with their colors largely intact. The quality of the art in this place took my breath away. Each scene, each depiction was a masterpiece of design and execution. One can only wonder what this temple must have looked like when it was new and thriving. They say that the ancient Egyptian pigments were excellent. That if protected, they would last nearly indefinitely. Unfortunately, for many of the temples that we visited, once abandoned, they were used as sources of limestone and then as refuge for squatters. It wasn't until relatively recently that the Egyptians, themselves, placed any value on these ancient sites. 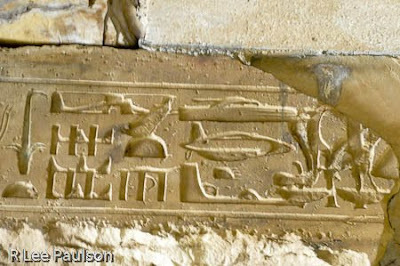 Here is the one flash photo we were able to get in front of a relief. (Flash is not technically allowed.) The color here is not too bad. Please try to mentally extrapolate these color tones into the following images. The hawk headed individual on the left behind us is Horus, on the right is the pharaoh, notice the triangular apron, also his hat with the cobra and the vulture. When Napoleon came through with his army in the early 1800's, he brought with him a large number of surveyors and scientists. They extensively documented the ruins they found then. 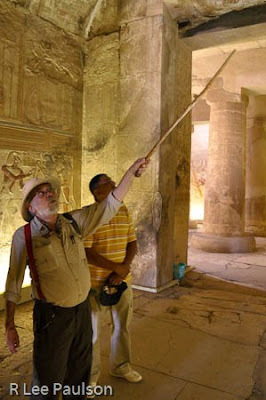 Now, many of those sites have been completely destroyed because the Egyptian farmers quarried the temples as a source of limestone, which they burned and scattered in their fields. 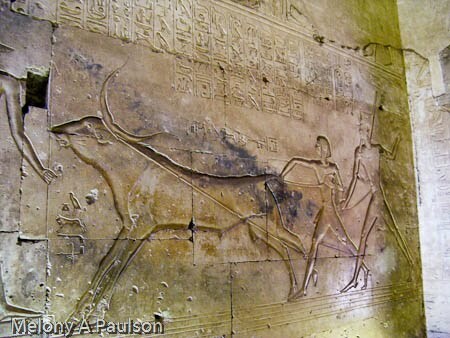 Indeed, the crew of the ship on which we stayed in Luxor referred to the ancients sites as "just a pile of rocks." They thought that we were out of our minds to travel so far to see these things. They had no interest at all in seeing the ancient sites of their own country. "Just a waste of time," as one of them said. So, for us to find this and other temples in such a remarkable state of repair after several thousand years of abuse was certainly a testament to the ancient builders and their construction skills. We see Horus again on the right, the pharaoh in the middle and I am not sure who is on the left. The color here is a horrible rendition of the actual colors. The images below are not quite as bad. I have to confess that when I first wandered through this temple, I was completely overwhelmed. John Anthony West began pointing things out, this god doing this, that god doing that. It was too much for me to take in anything but the vague outline of what he was saying. It seemed that being able to understand any of what I was seeing would take more time than we had in Egypt. That turned out to be true. The problem of decoding the symbolism is compounded by the fact that many versions of the ancient myths exist. And, in the case of the Osiris story, which we'll touch on momentarily, no written Egyptian record exists. All we have are documents handed down by ancient travelers to Egypt who came home and related the story as they claimed to have heard it. It is impossible to tell which of the tales is the original Egyptian version. 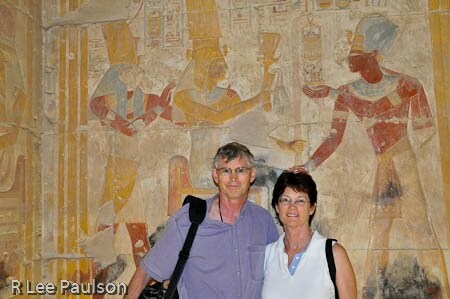 Here we have the pharaoh on the right, notice the crown and the apron again, and Anubis on the left. Notice the quality of the carving and how brilliant the colors still are. Also compounding the task of deciphering the panels is the fact that, as mentioned before, the complexity of the ancient Egyptian symbolism, with it's many layers, allows for the same 'god' to be represented in many different ways, depending upon the context. 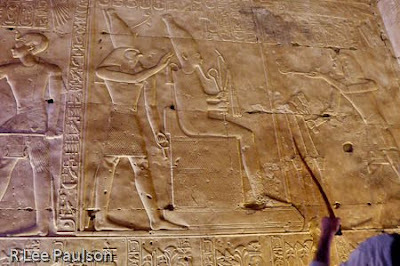 Here is West pointing out Horus on the left, Osiris, as a mummy in the middle, with the pharaoh on the right. With respect to the gods, the Judeo/Christian religions differentiate themselves from other ancient 'pagan' religions by the fact that the Jews and the Christians only worship one god whereas the ancients had many. I distinctly remember this distinction from Sunday school as a child. For what it's worth, that claim is not entirely true. For it presupposes the ancients had no idea of 'one god'. Here we have Isis as Hathor on the left and the pharaoh on the right. Notice the horns on Isis, and the disk between them. The disk signifies that she is in her 'godly' persona. The horns are representative of a cow, which symbolizes fecundity. As part of the creation process the various concepts and scientific principles were 'created', nearly all of whom were anthropomorphized into a panoply of 'gods' and given human names and attributes, and also animal attributes. The equivalent for us would be like having our Christian God create another 'god' who was 'in charge of' gravity. We would worship (more accurately acknowledge) that god for keeping our feet firmly planted on the earth. That god would then interact with other 'gods'...and on it would go. That is the closest way I have of describing the ancient thought and teaching process. So, Atum first created the world, he then created Shu and Tefnut, who then created Nut, a daughter, who represented the sky, and Geb, who represented the earth. They in turn sired Osiris, Isis, his sister, Set, and Nepthys, another sister. John Anthony West was at his best in places like this. He always seemed a little more alive when he was explaining something to us in a temple. Of all the myths in ancient Egypt, the Osiris myth is probably the most pervasive. It would be like our version of the story of Jesus to us. The story of Osiris is lengthy and has many versions. 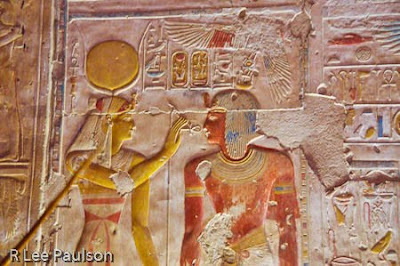 The short version has Osiris marrying his sister Isis. Osiris became king after Geb, was very well liked, loved and admired. Set, Osiris's brother, was jealous of this and when Osiris traveled abroad, after teaching his people agriculture, and other skills necessary for the establishment of a civilized society, Set began a plot against Osiris. When Osiris returned, Set and his 72 followers had a huge party. The number 72 is is significant because it is the number of years it takes the earth to travel one degree in the processional cycle. Multiply 72 times 360 and you get an accurate number representing the length of the processional cycle. So, according to West and Schwaller de Lubicz, whenever one sees the number 72, it is a symbol for time. At any rate, at the party was a specially made, beautiful box. Set said that whoever fit into the box could have it. When Osiris climbed in, he fit perfectly because the box was made exactly to his dimensions. The instant he was inside, Set and his followers put the lit on, nailed it shut, covered the top with lead and threw it into the Nile. 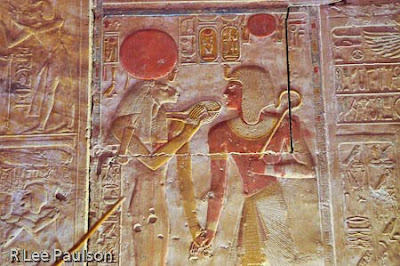 Sekhmet, as a god, (with her disk) and the pharaoh. Notice how perfectly her face is rendered. 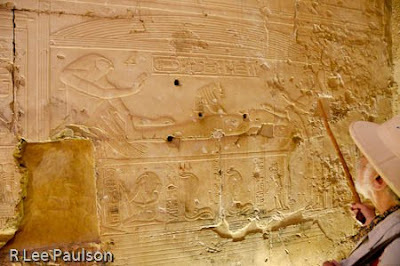 Notice also how the reliefs and hieroglyphs on the sides have been created by removing the material around them. I can't imagine how much time it must have taken to do that as perfectly as they did. The box with Osiris inside floated down the Nile and landed in Syria. Isis went searching for it, found it and brought it back. But, Set found it and cut Osiris's body up into pieces and scattered them all over Egypt. Isis went searching for it and found them all except the phallus, which Set had thrown into the river and it had been eaten by a fish. Isis taped Osiris back together (the original mummy) and beseeched Sokar, another god, for help to bring Osiris back to life. Sokar granted the wish, but only for an evening, and also gave Isis a magic golden phallus to replace the one lost and eaten by a fish. Osiris came alive for the evening, fecundates Isis with the golden phallus, thus giving us an example of one of the first immaculate conceptions, as it were. Isis, being impregnated by the animating principle of life in the form of the golden phallus. Isis then gives birth to Horus, a son, who goes after Set to avenge his father's death. This is the only representation that we know of for the 'immaculate conception' from ancient Egypt. Osiris lays on his bier wrapped in mummy's tape. Isis, in a bird form, lowers herself on the golden phallus. West claims the figure on the left is Sokar, the one who created the golden phallus. He sure looks a lot like Horus to me. It could be that Horus is meant to be shown at his own 'conception'. I don't know. The figures below the bier all have meaning, too, but I don't know what it is. Here is a close up of Isis descending upon the golden phallus. Images of Isis in her bird form are common through out Egypt. Usually, though, she has her wings spread open. Believe it or not, that was the short story. West's point is that the story resonates on many different levels. On one level it is the story of the cycle of life, and the journey a person takes as they incarnate on this plane, gather experience, and then make their way back to The One, as Horus. 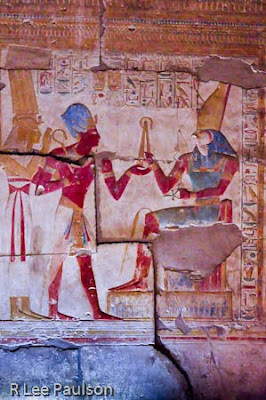 West claims that stuffing Osiris into a coffin and covering it with lead symbolizes the descent of spirit into the flesh. The coffin floats down the river of time. Others claim that Horus represents the reincarnation of Osiris and that the story is meant to show the cycles of death and rebirth. Note also, that back in ancient times, the sky was a lot brighter with stars than now. (They had no electric lights in their cities to blot out the stars.) At night, the milky way 'ran like a river' above the Nile. So, when the casket is thrown in 'the river', it likely has both a literal and astronomical meaning, both of which signify the passage of time. On a deeper level we have the so called clash between Set's jealousy of Osiris, symbolizing the jealousy that flesh and the 'untamed world' have for spirit. How the flesh and 'untamed' world tempt spirit with worldly pleasures and trap it for a period of time. 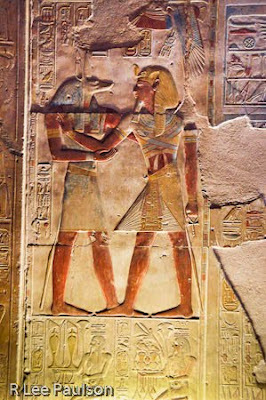 It's interesting to note that Horus often defeats Set but never actually kills him. Here is where that principle of the idea of three comes in. Set, as the opposite pole of the battery, so to speak, is necessary in order for the polarity of life to work. Without the potential between the principles of Set and Horus, life would be impossible. So, the idea, as the ancients show, is to gain dominion over our own inner 'untamed world'. They show this in a myriad of ways. More of which I'll present next time. Here we have individuals pulling the tail of the bull and restraining it with rope. This, West claims, symbolizes dominion over one's sexual desires as the bull is a symbol of raw sexual energy. All of the above meanings represent only conjecture on our part, of course. They are West's version of an educated guess from Schwaller de Lubicz and what West calls the symbolist's perspective. 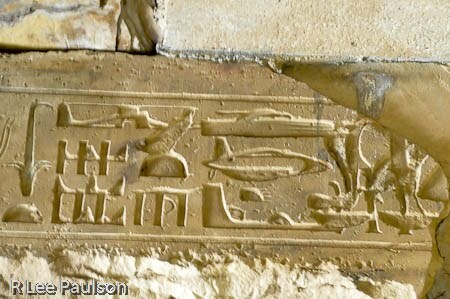 Take close look at the hieroglyphs above, found on a beam near the entrance, and see what you think. Some say that we're looking at a helicopter, a tank and a space ship. West thinks not, and has his reasons. All I can say is, the mystery deepens. 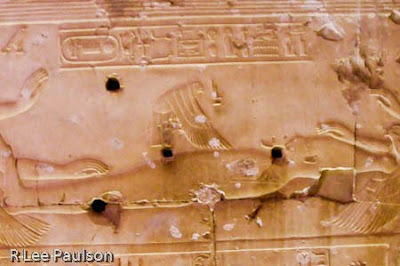 Continue on to Post 20: Abydos III by clicking here.